The Dread Deadbeat Pro-Se Kimberlin has a history of playing games with service of court papers and then seeking default judgments against his law fare victims. The incident chronicled in this post titled 29 ≠ 20 from five years ago today is an example. 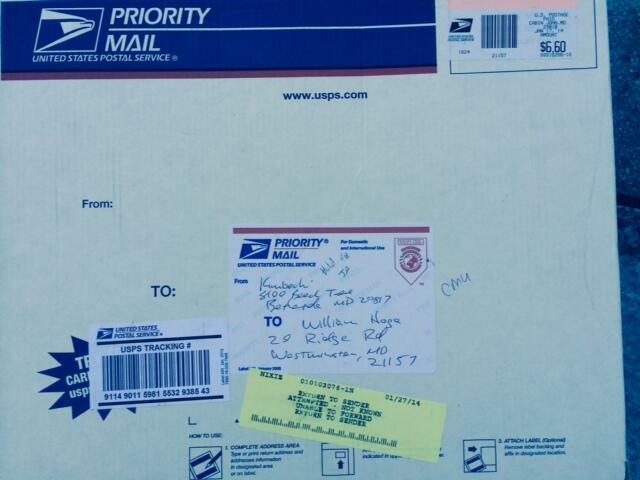 Yesterday, a picture appeared on the Interwebz of what is purported to be the envelope returned to The Dread Pirate Kimberlin of his attempt to serve some court papers on me. Here is the image as it was posted on Twitter. I have not bothered to redact it, but have left it as published by TDPK. It appears to be addressed to 29 Ridge Road. I live at 20 Ridge Road. No wonder the Post Office found it to be “Undeliverable as Addressed.” No wonder the clerks at the Westminster Post Office couldn’t find mail being held for 20 Ridge Road. So two wrongs made a right? That sounds perverse, but maybe God is looking out for you, brother Hoge. I was going to comment that he wrote a sloppy Zero that looked like a Nine, but then I checked out the Zero he wrote in his zip code. I appears that the Legal Genius wrote a sloppy Nine.